I gave up trying to keep up with my younger brother’s slang. I avoid employing the ones that used to be trendy at the time when I was in high school, because he would laugh at me. He makes me feel “outdated” and he is only three years younger than me. When I was about sixteen or seventeen and my parents would leave us alone at home for the day, I was the one in charge of cooking lunch. My brother hated it. Not my cooking, but my taking over the kitchen without my mother in sight meant one thing: recipes experimentations. My recipes involved greens, tons of vegetables and sweet and savory dishes. In other words, all what my brother hates. My brother is a big meat lover. Just go ahead and give him any kind of dish that engages big chunks of meat, red meat preferably, and he will praise your cooking skills for the rest of the day. Luckily, he has learned to appreciate other dishes that don’t systematically involve meat. This dish is one of his favorites. I know he would rather have it without dried fruits but everyone has his or her own upgrades. I usually cook pilaf rice, but was intrigued this time by Chelo, the Iranian steamed rice. The traditional way of cooking Chelo is soaking the rice in salted water for a minimum of 2 hours, draining then cooking it in fresh water; and then “steaming” it for 40 min with some butter in a pan covered with a lid and a dishtowel. The corners of the dishtowel are then folded over the lid. The rice becomes soft and fluffy, never soggy and sticky. This is a quicker method of cooking Chelo. Don’t skimp on the soaking time, though. A minimum of 30 min is required to soften the grains and improves the flavour of the finished dish. You can use either basmati rice or long grain rice. I used ground lamb to stay in the Mediterranean/ Middle Eastern theme, but you can use ground beef, ground turkey or even no meat at all if you are a vegetarian. Place the water and salt in a pan and pour in the rice. Set aside to soak for at least 30 min and up to 2 hours. Bring the water and rice to a boil, and then reduce the heat and let it simmer for 10-15min, until the water is absorbed. Add the butter to the rice. Cover the pan with a tight-fitting lid and steam over a very low heat for about 30 min. Meanwhile, heat the oil in a pan over medium heat. Add the lamb and sauté quickly just to give it a nice color. Add the onion, turnip and season with salt and black pepper. Pour in the stock, cover and let it simmer until the meat is cooked through, about 15 min. Uncover the pan, add the dried fruits and let the liquid reduces. Sprinkle some cilantro on top of the meat mixture and combine with the rice prepared earlier. Set aside. Preheat the oven to 400F. Cut the top off the zucchinis. Using a spoon, scoop the flesh out of the zucchinis. Season with salt and black pepper and set aside on a greased baking pan. 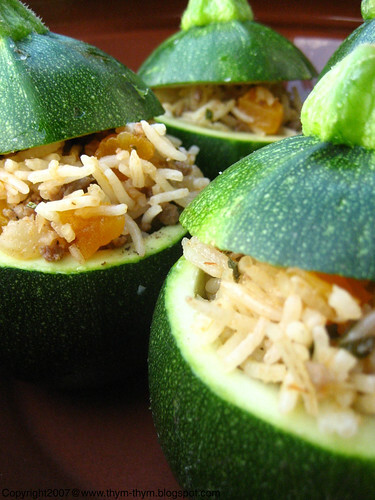 Spoon the rice and meat mixture to the zucchinis; place the top on each of them. Cover the baking dish with foil and bake until the zucchinis are tender, when poked with a toothpick, about 30min. Let it cool slightly and serve. Mettre, l’eau, le sel et le riz dans une casserole. Laisser tremper au moins 30 min ou jusqu’a 2 heurs. Porter le riz a ebullition, puis reduire le feu et laisser cuire pendant 10-15 min juqu’a ce que l’eau soit absorbe. Ajouter le beurre mais sans le melanger. Couvrir la casserole fermement d’un couvercle, puis faites cuire sur feu tres doux pendant 30 min. Entre temps, faites chauffer l’huile dans une poele. Ajouter la viande et faites sauter rapidement. Ajouter l’oignon, le navet et assaisonner de sel et de poivre. Couvrir du bouillon et laisser cuire jusqu’a ce que la viande soit completement cuite, environ 15 min. Ajouter les fruits secs at laisser le liquide reduire sur feu vif. Parsemer les feuilles de coriandre au dessus. Melanger la viande au riz et mettre de cote. Prechauffer le four a 200C. Couper le chapeau de chaque courgette et mettre de cote. Vider les courgettes a l’aide d’un cuillere. Assaisonner l’interieur de sel, poivre et mettre les courgettes dans un plat allant au four, legerement huile. Remplir les courgette du mélange riz-viande. Couvrir le plat d’une feuille d’alluminium et faites cuire jusqu’a ce que les courgettes deviennent tendres quand on les perce avec un cure-dents, environ 30min. Laisser refroidir legerement et servir. These look so good! I love stuffed vegetables. Ah, I've just posted about basmati, and here you are with this wonderful recipe! I'll have to try it. I am intrigued by the traditional was of cooking Chelo. I've never cooked with globe zucchinis, actually, I've never even seen them before. That photo looks is whetting my appetite. Rose, the story is lovely! Ans so is this wonderful recipe. I like stuffed veg, so this recipe is defenitely something I will try. This looks great! I've never used apricots in a savory dish before and will be nice to try. Thanks! Lots of possibilities with "upgrades." These look so good. - Deborah, thanks. I am glad you like them. - Lydia, now how funny is that! I'll have to try your pudding. - Wendy, I have a carnivore at home too and he always looking for "upgrades". Glad you like my courgettes. - Hi Nora, he is going to be thrilled to hear that his slang is being used even in Australia. I've never cooked chelo before but I already adopt it. I was surprised to see that the rice wasn't sticky, even after 40 min of cooking. - Anh, thank you so much. You are too sweet. - Rose, thank you very much. You should try it. It gives just the right amount of sweetness to the dish. - Hello Tanna. Lots of possibilities indeed. - Merci Mima pour ce message. Je n'aimerai pas etre a la place de la garaaa! - Inne,Thanks a lot. I am glad you like it. Even my carnivore hubby adopted this word. Rose, I'm gonna try to find out if I can find this kinds of zucchini here - I'd love to try your recipe! - Patricia, I hope you will find them. If not you can always use the kind of zucchini that has a pale green exterior, and is smaller and thicker than the standard green zucchini. Ihope you know which one I am talking about. If you use this kind, just lower the time of baking. Have a nice week and let me know how it goes.